What Can I Learn in an Online Master’s in Economics Program? What Can I Do With a Master’s in Economics Degree? How Much Can I Make with a Career in Economics? With an online master’s in economics degree, graduates pursue careers as economists, statisticians, and analysts. Depending on their concentration, economics students may study applied economics, quantitative research methods, or international economics. A master’s degree helps professionals advance their careers and increase their salary potential, and many positions, such as economist or statistician, call for candidates with a master’s degree. According to the Center on Education and the Workforce, professionals with a graduate degree in economics earn $33,000 a year more, on average, than professionals with a bachelor’s degree in economics. With opportunities for growth and lucrative salary potential, an online master’s in economics helps professionals elevate their careers. This article introduces prospective students to the best online master’s programs. Because a solid understanding of economic practices, principles, and theory is beneficial to so many different careers, online economics master’s degrees are available at an impressive number of institutions. How can students narrow down their options? What makes a graduate level economics program stand out from the crowd? One way to identify top-notch programs is to examine our rankings of the Best Online Master’s in Economics Degrees for 2018. The graduate degree in economics program at South Dakota State University offers tracks in economic theory or applied business-economics. The latter track is offered in a hybrid format. Students can choose to concentrate in business economics, agricultural business, agricultural and resource economics or general economics. Those currently earning their undergraduate degree can apply for the Accelerated Master's Program in economics. Graduates with a Master of Science in Economics degree can explore careers in business and government, or pursue advanced studies in finance and economics. SD State offers a range of financial aid options for students. The University of Missouri offers a 2-year online graduate degree program to students interested in pursuing their master's in economics. Courses are semester-based and can be taken in a completely online format. Graduates from UM's Master of Arts in Economics degree program can pursue careers as data scientists, quantitative modeling analysts, directors of institutional research or energy markets managers. Online students qualify for in-state tuition rates and can apply for financial aid such as loans and scholarships to help pay for their degree program. Students who have earned undergraduate degrees in STEM fields can apply to earn their master's in economics online or through a hybrid format at Purdue University. The online Master of Science in Economics degree program offers an Applied Economics/Business concentration and an Advanced Theory thesis concentration. The program is designed to be completed in 2 years as a part-time online student, and current Purdue undergraduate students in STEM majors can enroll in a BS/MS combined degree that counts some of their undergraduate hours toward completing their master's degree in economics. The University of North Dakota offers a 2-year online master's degree in economics with a thesis or non-thesis option. Students earning their Master of Science in Applied Economics through this program work with a faculty adviser and can attend classes on a set schedule or in an asynchronous format. Graduates can pursue careers in consulting, economic research and forecasting in private industry settings or in the government. Online students can access financial aid resources to see if they are eligible for financial or private aid to pay for their degree program at UND. Georgia Southern University offers a master's degree in economics through an entirely online format. Students can pursue their Master of Science in Applied Economics to learn about a range of market, economic and financial topics. Graduates can pursue careers in financial institutions, federal and state regulatory agencies, government enterprises that focus on financial economic development and public utilities. Online students can speak with the college's financial aid office by phone or email to determine their financial aid eligibility. Golden Gate University offers an online graduate degree in business analytics for students interested in studying economics. GGU's Master of Science in Business Analytics connects data analytics with problems in the business field, addressing statistical and analytic theory, processes, tools and techniques to fix these problems. Graduates are prepared to apply data analytics as business managers, data scientists, subject matter experts and IT professionals, among other careers. The college offers a range of financial aid opportunities to students, including federal, state, institutional and private aid. 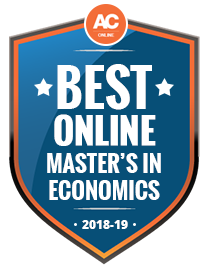 During an online master’s in economics program, graduate students study quantitative and empirical economics, with core classes in microeconomics, macroeconomics, and applied economics. Graduate students learn about economic theory, analyze research and arguments in the field, and study advanced data analysis techniques. Most master’s in economics programs require two to three years of full-time study, with students completing between 30 and 45 credits. Some programs also offer a part-time option, which may add several years to the degree. While both online and on-campus economics programs offer similar curricula, students in an online program may complete their coursework at an accelerated pace, depending on the program structure. Some graduate students prefer the flexibility and accessibility of online economics programs, which often let students arrange coursework around work and family obligations. What’s the difference between a master’s in economics and an MBA in economics? A master’s degree in economics and an MBA with a specialization in economics both prepare graduates to work as economists. However, a master’s in economics offers a more in-depth curriculum focused on economics, while MBA students complete a broader range of business courses. In a master’s economics program, students take advanced classes in qualitative methods and analytical skills, with electives covering subfields in economics, such as international economics and behavioral economics. The degree provides training for professionals who work in advanced positions in economics. An MBA, by contrast, trains students to work in managerial positions in business. What common courses are offered in a master’s in economics program? Each economics program designs its own curriculum and specialties, depending on the program’s focus. Some programs emphasize applied economics, while others emphasize empirical economics. The sample curriculum below lists some of the most common courses offered in a master’s in economics program. Macroeconomics courses train graduate students to analyze national output, unemployment, government debt, inflation, and other macroeconomic variables. Graduate students learn how to interpret data and understand macroeconomic policy. The course may also emphasize the link between economic theory and applied economics, including economic policy. Microeconomics courses introduce graduate students to the advanced study of microeconomics, including economic models, theories, and tools. The course may cover game theory, price formation, and consumer choice, with graduate students studying different market structures and their influence on the market. Microeconomics courses may also emphasize individual decision making, including behavioral and psychological factors that influence decisions. Data analysis classes provide tools for students to design empirical research studies and analyze the results of their research. These courses may cover statistical programs and methods, sampling errors, statistical model evaluation, and hypothesis testing. Students may also complete group research projects. Econometrics courses train graduate students on using statistical tools to estimate economic relationships. Students study the linear regression model, instrumental variables, panel data analysis, and modeling. The course prepares students for careers as economists or statisticians, providing strong quantitative research skills. An elective offered for economics students interested in global economics, international economics classes study the impact of globalization on markets, the international market for goods, and the global capital market. Students learn about models of international economics and the economic relationships between countries. 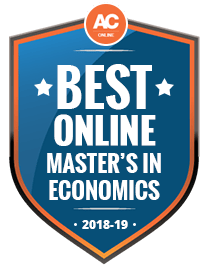 Most online master’s in economics programs require students to complete research projects, pass examinations, and write papers during their coursework. In a data analysis course, for example, students may be required to design a research study with economic data provided by the program. In addition to coursework requirements, many programs include a capstone course. The capstone often draws on the skills gained during the program, allowing graduate students to apply their knowledge. Graduate students typically design the project in consultation with their faculty adviser, and it may involve designing an original statistical study, analyzing a real-world economic issue, or writing a thesis. What specializations are available in a master’s in economics program? Some master’s in economics programs offer specializations, which allow graduate students to concentrate their skills in a particular area, such as applied economics or quantitative research. The concentrations offered in each program vary, but the following list highlights some of the most common specializations. A specialization in applied economics balances economic theory with its application. Students in this concentration may take classes in labor economics, public economics, or health economics. The program prepares graduates to work in economic policy, public sector jobs, and in specialized fields such as healthcare, insurance, and finance. While all economics students build quantitative skills, some programs offer a specialization in quantitative research with additional elective courses in the subfield. Graduate students may take courses on microeconometrics, macroeconometrics, business forecasting, and game theory. The specialization emphasizes rigorous mathematical and statistical methods, preparing graduates to work in quantitative research fields. A subfield of applied economics, an economic policy specialization emphasizes the creation, implementation, and outcome of government economic policies. In addition to building qualitative research skills, economics students in this concentration build policy analysis skills and study the real-world impact of economic policy. Graduates work as policy analysts or research analysts. A master’s degree in economics qualifies graduates for careers as economists, statisticians, and analysts. As a versatile degree that emphasizes quantitative skills, critical thinking, and research, economics programs prepare graduate students to work in public and private sector jobs as consultants, economic advisers, and managers. While an economics degree does not guarantee positions in these fields, candidates with a graduate degree benefit from increased competitiveness in the job market. Some career paths may require additional certifications or licensure in addition to a master’s degree. For example, financial analysts may need a license from the Financial Industry Regulatory Authority, and some employers recommend certification to expand career advancement opportunities. Economists analyze data on the production and distribution of economic products. They research trends, evaluate economic issues, and forecast future economic conditions. Many work in state or federal governments, as well as in scientific research, management consulting, and the finance industry. They may work independently or collaborate with other economists and statisticians. Most positions require at least a master’s degree in economics or a closely related field. Statisticians analyze data, applying mathematical and statistical techniques to solve problems in business, government, healthcare, and other industries. They may work for private companies in the sciences or engineering, for government agencies, or in research and development. Most statisticians hold a degree in economics or a closely related field, and most entry-level positions require a master’s degree. Budget analysts organize finances, prepare budget reports, and monitor spending for public and private institutions. They may review budget proposals to ensure they comply with regulations, develop budgetary guidelines, make recommendations for financing, and project future financial needs. Employers require at least a bachelor’s degree in economics or a related field, and candidates with a master’s degree may qualify for more advanced positions or higher salaries. Some positions, such as government budget analyst, call for certification. Financial analysts help businesses and individuals make investment decisions. They analyze stock performance, manage investment portfolios, and research financial data to make projections. Financial analysts also study economic trends, prepare financial reports, and give recommendations on financial decisions. They may work for large financial institutions, in management-level positions in the business sector, or in insurance. While entry-level positions require a bachelor’s in economics or a related major, financial analysts with a master’s degree may qualify for positions as portfolio managers or fund managers. Economics professors teach classes in economics at the postsecondary level, working in two-year or four-year colleges and universities. In addition to designing classes, creating syllabi, and teaching courses, professors typically conduct research and publish their findings in scholarly journals. While many tenure-track teaching positions require a Ph.D., candidates with a master’s in economics may qualify for instructor, adjunct, or community college positions. Graduate students benefit from joining professional organizations, which offer meetings, events, and conferences to share research and network with professional economists. Many organizations also offer career centers with job postings, career counseling, and other job-seeking resources. Some organizations publish research, conduct surveys, and provide economic data to members. Founded in 1885, AEA offers scholarly publications, an annual conference, and resources for students, including guidance on preparing for graduate study in economics and a career center with job listings. The association also offers job market advice, economic data, and information about grants and scholarships. The IEA promotes worldwide networking opportunities among economists. It hosts meetings and conferences, promotes research programs, and publishes research on current issues in global economics. To encourage collaboration, the IEA publishes working papers on its website, hosts roundtables, and publishes proceedings from events. NABE represents business economists and professionals who use economics in their jobs. The association offers conferences, educational resources, and career development support. NABE also provides industry surveys and confers the Certified Business Economist credential. With an online master’s in economics, graduates pursue careers as economists, statisticians, analysts, and professors. These positions offer lucrative salary opportunities, with the median salary for economists exceeding $100,000 a year. Even the lowest paid professionals in these fields earn above-average salaries. Salaries vary depending on the professional’s degree level. Research conducted by the Center on Education and the Workforce indicates that professionals with a bachelor’s degree in economics earn a median salary of $76,000 a year. With a graduate degree in economics, the median salary increases to $109,000 a year. This average increase of $33,000 represents the salary growth that economics professionals may see by earning a master’s degree. Accreditation indicates that a program or university follows best educational practices and adheres to high academic standards. A voluntary process, institutions submit to review by independent, nonprofit accrediting agencies. Regional and national accrediting agencies assess an entire college or university, while specialized programmatic accrediting agencies review a program, such as a teacher training program, a social work program, or a business school. Depending on the university’s structure, economics programs may be housed in the business school, the school of economics, or in the college of arts and science. Because economics does not have a programmatic accrediting agency, prospective students should instead choose a nationally or regionally accredited college or university. A degree from an accredited institution increases financial aid, education, and employment opportunities. Graduate students pursuing an online master’s in economics benefit from scholarships, fellowships, and financial aid opportunities. Federal and state financial aid programs may offer loans or other support, while many universities offer fellowships and assistantships. Private organizations, government agencies, and foundations also offer grants and scholarships to support economics students. The federal financial aid program supports graduate students with loans, grants, and work-study opportunities. Applicants must submit the FAFSA, or Free Application for Federal Student Aid, each year to qualify for financial aid. Some programs, such as the work-study program, require demonstrable financial need. Many universities offer support for graduate students in the form of fellowships and assistantships. For example, the London School of Economics offers Master’s Awards to international students that cover full tuition. Teaching and research assistantships often provide a tuition waiver plus a stipend. Students can research funding opportunities at each program. The American Economic Association provides a list of funding sources for economics students, including grants, fellowships, and scholarships. The resource also lists private, government, and other funding opportunities for students pursuing an online master’s in economics. Offered by the Government Finance Officer’s Association, this scholarship supports state or local government employees pursuing a master’s in economics part time while working. Candidates must provide two letters of recommendation, and winners receive a $10,000 award.